In recent years, many workers who lost their jobs, farmers who lost their lands, and residents whose houses were forcibly demolished and relocated, have accumulated growing conflicts with Chinese authorities. 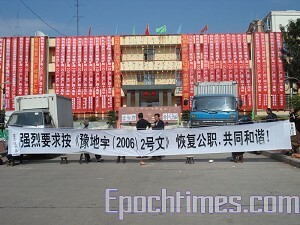 As a result, large-scale protests are continually reported all over China. 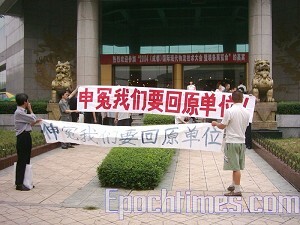 Experts have said that the growing protests indicate that some related regulations have lost their effect. 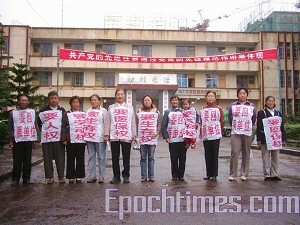 As reported by various media, most of the cases have been filed by groups of people, rather than single individuals. In cities, forced demolition and relocation is one of the most significant issues of complaint. Mass demonstration and protests are growing everywhere and conflicts have become intense. 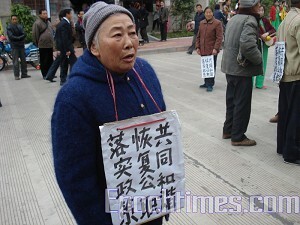 The following photos show unemployed workers in Henan Province protesting.